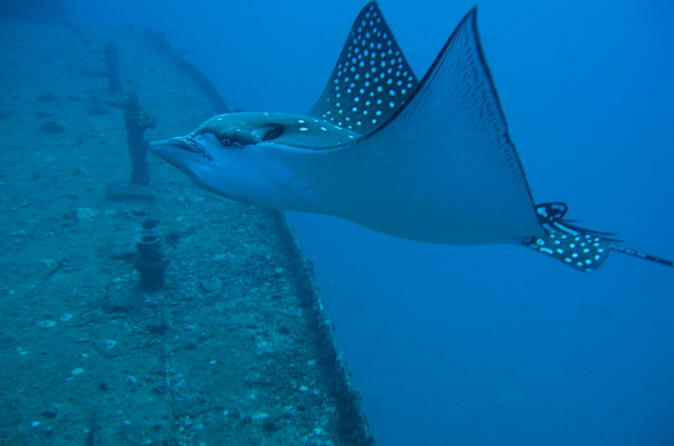 Explore the waters off the coast of Oahu on a two tank dive, ideal for first-time divers. Board a private boat and head out to two separate diving locations in the Pacific, traveling in the company of PADI-certified instructors. Come face-to-face with eels, spotted eagle rays, octopuses, and more while perusing local waters. Perfect for snorkelers, too. Begin your 2-tank scuba diving adventure with either a 7:15am or 10:15am pickup from your centrally located Waikiki hotel. Together with your group, you’ll head directly to the dive shop. Here, you’ll get fitted with equipment and journey out into the Pacific on one of two private charters. Get ready to hop into the water at two individual dive spot,s where it’s common to see turtles, eels, octopus, spotted eagle rays, and many other forms of sea life. Along with an experienced captain, you will also be traveling in the company of PADI-certified instructors, available to offer tips and diving advice throughout. Perfect for first-time divers, this private charter can also accommodate intermediate and experienced divers, as well as all levels of snorkelers.